Depicts Shriman Narayana with his two wives, now begins my question is the goddess are wearing a Yagyopavit (yes look closely near nabhi/solar-plexus)!! Is there any scripture mentioning this or it is just an artistic imagination , depicting empowered women at the time of creation of this sculptor. According to Harita Dharma-Sutra the sacred-thread ceremony has been declared necessary for brahma-vadini or girl-students. They should beg also from their homes while studying Vedas and performing sacrifices, etc. (Harita Dharma-Sutra 30-21.22) Ladies having no sacred thread were called 'Sadyo-vadhu' and thus they remained unpolished. A lot of wives of sages, like Agastya's wife Lopamudra and Yajnavalkya's wife Maitreyi were Brahmavadini. In fact Lopamudra and Maitreyi were actually two of the seers of verses in the Rig Veda; see the Rig Veda Anukramani in my answer here. Vedas do not have any gender based discrimination. When it comes to vaidika dharma and practices both men and women enjoy same freedom. However, after the advent of sanyasa, the society slowly turned towards more male dominated and male chauvinistic in nature. Slowly women were deprived from their basic religious and social rights which were sanctioned by Vedas. As per Haarita sutra, those women who are Brahma Vaadini have right for initiation, Vedic studies , Fire establishment and bhiksha etc. Gobhila says that Bride should wear the sacred thread when the bridegroom leads her to the altar. A brahmacharin should be married to a brahmacharini. Rv. iii (55, 16) mentions unmarried learned and young daughters who should be married to learned bridegrooms. Without initiated by proper samskara, no one is eligible to utter holy vedic mantras. But women are found to utter them in many of Shrauta and Grhya sacrifices (yajnas). Yajnikadeva in the paddhati says वचनात् कुमार्या अपि मन्त्रपाठः meaning that maidens should too utter the sacred formulas as prescribed. In Madana pArijAta the author quotes KAtyayana (KAtyayana samhita p.330) to show that if any samskara before the initiation ceremony is left unobserved, it should be performed with offering of oblation. Since Madana deals with these things under strI samskara section it is clear that women are entitled to initiation. In the Varuna PraghAsas ( second four monthly) sacrifice, after havis is placed and when wife leading to the fire for the karambha pAtra oblations. She utters the mantra "प्रघासिनो हवामहे मरुतः ..." [Shukla Yajurveda Samhita III : 45 ] for invoking the Marut's. As per Shraddha Kalpataru "स्त्रीणामप्येवम्" etc means " याध्यशेन सम्बन्धेन पित्रुव्यत्वादिना पुरुषाणामेकादशाहादि श्रद्धं, तट्टशेन च सम्बन्धेन स्त्रीणामेतत् कर्तव्यमिति " which shows that women also utter the mantras in the shraddha. As per Shankha, the daughter too like the son after the samskara, should observe the Ashaucha and perform funeral rites and do pinda dana and celebrate the Ekoddishta for her father. Here too no distinction has been mentioned between son and daughter. "दुहिता पुत्रवत् कुर्यात् माता-पित्रोस्तु संस्कृता । अशौचमुदकं पिण्डमेकोद्दिष्टम् सदा तयोः"
One of the commentary of Gobhila sutra states that wife should be given enough education so that she becomes eligible to perform the sacrifice since the sutras do not say that she should offer oblations silently. From above evidences it is clear than women have right to vedas and yajnopavitam which is denied by most of vedantins. The female icons wear jewelry that is mistaken to be upavitam but they are not. 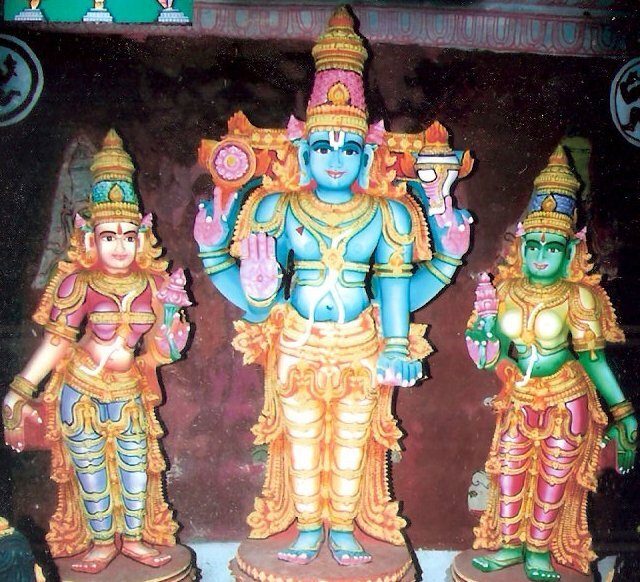 Thus I contacted a Tamil stapati who makes this kind of sculptures. As per his statement, these three strands have nothing to do with upavita. [Brahmin thread] It is called “sannaviram.” It is a designed ornament made with pearls or similar material and worn by women for decoration. Women in traditional Indian culture used to wear so many ornaments and this is just one another ornament. Not the answer you're looking for? Browse other questions tagged vishnu women lakshmi vedic-rituals samskara . Why do women not wear Yagnopaveetham (Janeu or Poonal)? How to live a life according to our scripture? Are there sects that prohibit their women from uttering “Om”? Do women face problem in conceiving if she wears rudraksh, does rudraksh has negative effect for women?